It is often stated Hiroshige started designing musha-e following Kuniyoshi’s succesful warrior prints. However, Hiroshige made most of his ichimai-e and nimai tsuzuki musha-e in the period 1818-1830. They must have been a modest succes because several prints are known in different states by different publishers. His musha-e after 1830 are mostly sanmai tsuzuki from the years 1844-1848 and are found in Suzuki’s catalogue under musha-e. Uchida however, considered Hiroshige’s later musha-e as rekishi-ga with the exception of the rare collaboration with his pupil Shigenobu in a nimai tsuzuki titled ‘Onzōshi Ushiwakamaru and Musashibō Benkei’. Furthermore a lot of influences from different artists like Katsukawa Shunei and Utagawa Toyokuni are visible in Hiroshige’s early musha-e. Interestingly, according to an article in the magazine The Sun Series (no.131, 1974, p 20), Hiroshige was inspired by his teacher Utagawa Toyohiro. The Waseda University Library holds an album by Iijima Kyoshin titled ‘Gahin’ with 5 prints from this series: http://www.wul.waseda.ac.jp/kotenseki/html/chi05/chi05_03771/index.html. Another print can be found in the database of the Boston Museum of Fine Arts: http://www.mfa.org/collections/object/women-by-a-gate-on-a-rainy-night-279126. Considering the fact that there are already 4 prints that are not mentioned in Uchida and this is a series in the yotsugiri format, there should be 16 or even more prints. Guy Pepermans found this print “Yatsuhashi” on a Japanese auction website. The number of kachōga is still not clear. Most western sources bring the number of designs to 600. Ōkubo estimates the total amount at around 1000 prints.1 Part of the problem is the fact that most small-size prints are classified under different formats and some museums give only outer measurements including what is left of the border. 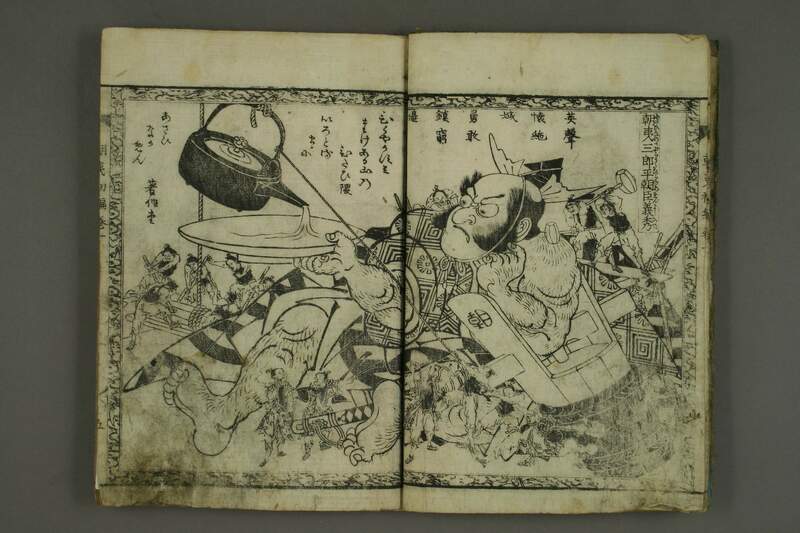 Website Museum of Fine Arts, Boston : yotsugiri, 10 x 16 cm (link). Website Honolulu Academy of Arts : 11,9 x 16,1 cm (link). I see that I am one of the sources of confusion, since I called the little print of the cuckoo by Hiroshige, MFA 21.8602, “yotsugiri” rather than “kokonotsugiri” as in the 1998 Ōta kinen bijutsukan catalogue or “koban” as in other sources. The problem is that yotsugiri and kokonotsugiri are almost the same size: 1/8 of an ōbōsho sheet (cut in a 2X4 grid) versus 1/9 of a sheet (cut in a 3X3 grid), respectively. To make matters worse, prints that have been cut apart have almost always been trimmed, so that it is nearly impossible to tell which size a small print is, unless you happen to know what the original, uncut sheet looked like. In this case I am guessing that it looked like, e.g., MFA 21.8600 and 21.8601, each of which has four similar horizontal kachōga on an uncut ōban sheet. Using the term “koban” for anything smaller than chūban is one way of getting around the problem, but it is confusing since koban is also a specific, standard size, namely half of aiban. I think the trend now is to avoid using koban in the general sense, but you find it often in older sources. According to Ukiyo-e daijiten (2008), kokonotsugiri was the standard size for surimono in the Kansei to Bunka eras (about 1790s to 1810s), before shikishiban (1/6 of an ōbōsho sheet cut into a 2X3 grid, so 1.5 times the size of kokonotsugiri) became popular. I notice that the 1998 Ōta Museum catalogue does not use the term yotsugiri at all; but I’m guessing that if they did it over again now, they would. Given the date of Hiroshige’s kachōga (1830s or later), the fact that they are not surimono, and the existence of things like MFA 21.8600, I’d go for yotsugiri for these works. The harimaze-e on the list are complete harimaze prints. A cut up harimaze in tanzaku format is part of a harimaze and thus falls under harimaze-e. Most harimaze-e on the list are ishizuri-e.
As in Yomigaeru bi (see topic notes) and Hiroshige no uchiwa-e (Okuda Atsuko, 2010), fanprints with flower and bird designs as well as series like 『六花撰の内』、『四季の花尽』、『風涼夏の花園』,『花尽見立福禄寿』 and several others are included in the list. Does a cut up harimaze print in tanzaku format count as a tanzaku kacho-e? As for subjects on fan prints: which do you classify under kacho-ga? It is preferable to have 2 sets of measurements: image and full sheet. The examples you gave are probably the full sheet-trimmed or not. For Suzuki’s entries see Catalogue. 1Umehara Munetaka, ‘Hiroshige’s Imayô Benten zukushi’, Ukiyo-e geijutsu, no. 60, 1979. 2Laura J. Mueller, Fujisawa Akane, Kobayashi Tadashi and Ellis Tinios. Competition and Collaboration: Japanese Prints of the Utagawa School. Leiden: Hotei Publishing, 2007. We would like to add the print above: ‘Ise Asamayama no zu’ which brings the total to the 10 obligatory prints. However, it is possible that the series was continued. 1Rupert Faulkner, Hiroshige Fan prints, London: Victoria & Albert Museum, 2001. This uchiwa-e is part of a private collection. This print is featured as entry no. 759 with a wrong title in: E. Polster, Hiroshige, exhibition catalogue, Albuquerque Museum, 1983.